Hola everyone and Happy 4th (though it feels as though it should be the 5th considering my family celebrated yesterday). Today something has been on my heart and mind and I wanted to bring forth my opinion about music (rock in general). About the time I was thirteen my Mom got me a Skillet CD for Christmas. Neither of us knew who the band was and quite frankly I was very much against rock music for a long time. If you know anything about skillet then you know they're a loud band with electric guitar, drums, occasional screaming (OK. A little more then that), and the wild hair and need I continue? Later I found I loved Switchfoot (much tamer), Disciple and Fireflight. •They probably have at least one piercing (ears, lips, etc, etc). It's wild. I know. Some people have told my parents that Christian Rock Artsists are going to hell or are following the devil. Others say they're fake Christians who need to reexamine their hearts. The leader Jon Cooper is definitely a tattoo clad man, but he has a heart for the Lord. I believe that his heart is totally in the right place when it comes to his and his band's music. I also believe that while Rock music is not really close to what we consider worship, if the lyrics are glorifying God and there is no provocative dancing or anything inappropriate going on, I believe that it is indeed God-honoring. And I believe that we need more bands like Skillet in the music industry. Think about it - Skillet, Disciple, Fireflight, Red (though I'm less familiar with that band), can impact so many people for the Lord! Skillet specifically seems to lead towards teens, and it's inspiring. Their music is dark but shows us the Light. It helped me through many times of feeling depressed and alone as a young teenager. It helped me see that I was far from alone and that God is walking right beside me, defeating the monsters that clawed. I think that what they wear (the hair styles and tattoos) may appear strange to those with a more conservative view but who can rock artists impact with their different personalities? I think of the people who dress in black clothing and listen to rock music for the rebellious reasons. They won't even touch on other music and what happens if they so happen to see Skillet? What if they hear them while they're touring with secular artists? 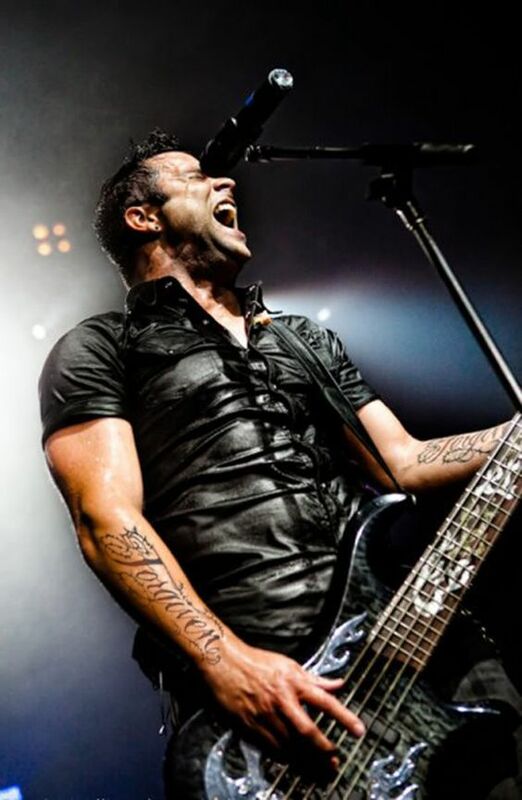 What if because of Skillet deciding to be Rock and wear what they do, they actually lead people to the Lord? God has made us a diverse people and we love different genres for many different reasons. I believe that if your heart is in the right place then being a Christian Rock artist doesn't make you a bad person. It doesn't make you less of a Christian. And frankly you shouldn't judge either. You just can't. God mentions in the Bible about letting Him be the judge and not looking at outward appearance. We can't take His place and go to a Festival and see a Christian band and instantly say they're not Christians by their long hair or black clothing or the fact that they scream during different songs. Maybe I'm being naive but I believe that it's wrong to point fingers, to tell someone they're going to hell. What do you think? What is your opinion? What an interesting post! I've been thinking about this a lot, actually. Yes, I agree. I think sometimes you can go overboard with rock, especially when it comes to showing off with your guitar skills and the heavy mascara on the guys (that's just too weird for me). I think every genre in the music industry has it's "look" though. I have a hard time sometimes telling the difference between any genre because they each have their own dress style, sound style, etc, not matter if they're Christian or not. Know what I mean? Comments make me smile, lift my spirits and give me the motivation to continue writing. In return I'll comment on your blog, because you're awesome and deserve it. Welcome to my blog, where authenticity is welcome, brokenness is real, and my heart is poured out onto the pages.